Easter Weaving Room | Easter School Baguio City | Go Baguio! You will enter the work area and watch the weavers at work at the looms to get a glimpse of the wide range of hand-woven articles such as: placemats and other table cloth, decorative wall hangings, bed linen, ethnic and ikat textiles, fashion and clothing accessories, religious garments, Christmas decor, foot wear, area rugs and mats, etc. Easter Weaving Room also sells baskets, wood carvings, fashion accessories and many more items. Easter Weaving Room was established in 1909, making it as old as Baguio City itself, which celebrated its 100th Anniversary on September 1, 2009. It was under the direction of Deaconess Anne Hargreaves that Easter School opened its doors to women with the idea of having the young women of the Cordilleras learn weaving so that they, too, may earn a living. Since then the classes continued under various headmasters and headmistresses, making it an important and integral part of one of the oldest educational institutions in the Summer Capital of the Philippines. World War II saw the destruction of the looms and other equipment and the weaving room was re-established in 1948 with the help of some women who had worked at there before the war. Today the school has expanded and grown to become Easter College, while the Easter Weaving Room has a new location in a building designed specifically for the purpose of housing several upright looms, accessible from the main road so that visitors will not have to enter the campus anymore. Compared to woven products around the City of Pines, particularly those available at the Baguio City Market and at Mines View Park, the quality of the items produced here is considered to be of superior quality and most times actually cheaper, its reputation carried across the seas, attracting customers from all over the world. Visitors are treated daily to the unfolding story of making the exquisite and intricate Montanosa cloth, watching in awe as expert weavers do magic with rainbow-colored threads. 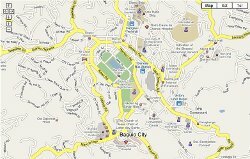 By car: From Burnham Park, which is at the heart of Baguio City, climb up Abanao Road, past Camp Allen and at the stoplight turn right to Bokawkan Road, head downhill and turn left to Easter Road, travelling for a few hundred meters more until you see Easter Weaving Room to your right. By taxi cab: All taxi drivers in Baguio City know the location of Easter Weaving (or Easter Road for that matter) so just tell the driver where to take you.